How to judge the two boy books that I read this weekend? Both leave me perplexed for entirely different reasons. 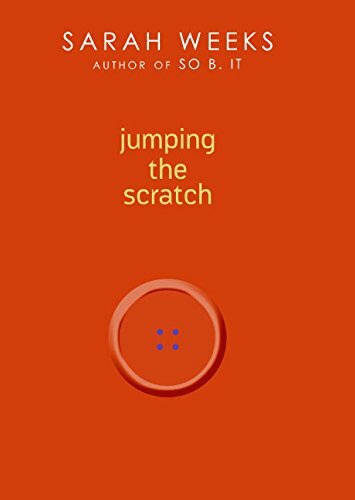 First I read Jumping the Scratch, by Sarah Weeks. Black and gray covers seem to indicate dark books, but this bright red cover showed me a happier read. I knew this was the author of So B. It, and perhaps should have expected more in the self-discovery vein. Also, like the other book, the author draws out the mystery of the past, allowing the reveal at the very end. But while this worked in So B. It, where the main character had to track down her mother’s story, in this case the story is inside the main character all along and he is trying to forget it. I don’t think the structure works as well, especially since the reader can figure out what the secret is early on in the book. Jamie and his mother have moved in with his aunt after Jamie’s dad left them. Their presence is welcome and needed, as his aunt had an accident at work and has lost her memory. She is able to remember things before the accident, but isn’t able to form new memories. Jamie and his mom try to find the right magic trigger that will bring it all back for her. At the same time, Jamie is struggling to forget something that happened to him not too long ago. When he meets a girl who lives in the same trailer park, she shows signs that she may know his secret  and that she may be able to help. The book is all right, and the issue of sexual abuse is handled well. But the secret is pretty obvious, and the conclusion to the aunt’s problems is unrealistic. And certainly not a bright-red, happy kind of book at all. The second tricky book was Gifted, by Beth Evangelista. 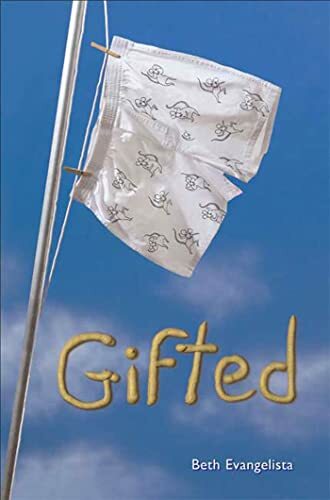 The cover shows a flagpole from which flies a pair of boxer shorts with white mice. Seems like a funny book. And it is, if you find bullying and tormenting amusing, which I don’t. This book is a tough call. The writing is funny. But the situation  avoiding getting beaten up  not so much. George is a smart kid loved by his parents and teachers, but not by his peers. He is especially tortured by the Bruise Brothers who seem to have it in for him. When he has to go on an eighth-grade sleepover field trip (are there schools that have week-long sleepover field trips?) away from the protection of his principal father, George knows the bullies are going to get him. All he has are his powers of avoidance and his best friend Anita. Through the course of the book, we find out how much George has always put himself first, so perhaps he has some of this coming to him. But I can’t buy that any kid deserves to be beaten up because he has been selfish and superior. While the writing is very funny, I would like to see it applied to a different plot than avoiding getting beaten up, which doesn’t make me feel so good laughing about it. There were some good moments in the book, and a point at which George has to face his fears. But overall, not as humorous as a pair of boxers up a flagpole might lead you to believe. in the world of private schools, there are plenty of eight grade 2 night trips - to dc, ny and williamsburg...so the premise is entirely plausible.